All transactions are safe and secure with a reliable history in online purchasing behind each of our associates. Buy the There Will Be Blood Oil Tower t-shirt to own There Will Be Blood clothing and merchandise. The front of this oil-colored tee displays a fitting design. An oil tower is shown with the milkshake quote next to it. Daniel Plainview's (Daniel Day-Lewis) movie quote from There Will Be Blood appears to the right of the tower. 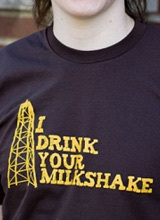 These attractive I Drink Your Milkshake t-shirts offer an original design that is perfect for fans of the movie. Get yours while they're still available. In addition to the There Will Be Blood Oil Tower tee above, browse the There Will Be Blood Clothing Gallery for more apparel like men's and women's clothes, kids shirts or hoodies.